It's important to keep your business and personal records in case of an IRS audit or other examination. This guide outlines the recommended length of time you should keep certain documentation. Generally, you must keep your records that support an item of income or deductions on a tax return until the period of limitations for that return runs out. 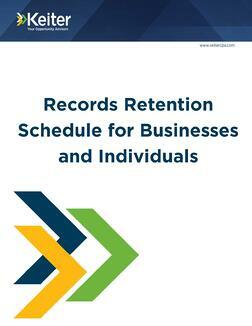 However, retaining unnecessary records may cause a business or individual to exceed available storage space. Our business and individual Records Retention guides are a great reference tool that will you help you in answering the question…to keep or not to keep. Accounting | Tax | Audit – Keiter CPAs is a certified public accounting firm serving the audit, tax, accounting and consulting needs of businesses and their owners located in Richmond and across Virginia. We focus on serving emerging growth businesses and companies in the financial services, construction, real estate, manufacturing, retail & distribution industries and nonprofits. We also provide business valuations and forensic accounting services, family office services, and inbound international services for companies with subsidiaries in the United States.